I’m excited to share with you today what I think is the Best Home Made Wheat Bread Recipe (made from scratch) while highlighting the awesome Wonder Junior Hand Grain Mill! 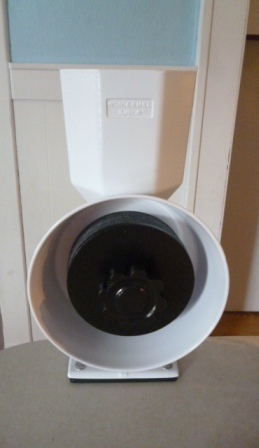 Last month in THIS BLOG POST I introduced you to this super handy grain mill, how to set it up, clean it, and mentioned some of it’s great features! 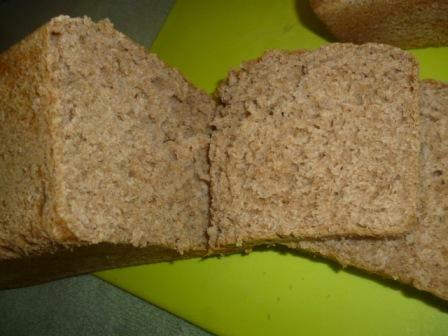 In a few seconds I was able to take wheat and grind it into a perfect bread flour. We go through 2 loaves of bread a week for my family. In order to stretch my family’s budget I was buying the cheapest loaves possible ($1.99 per loaf). It was costing us about $16 a month for bread, which I didn’t think was too bad for the month’s school lunches and the occasional toast for breakfast. Until one day I looked at the ingredients label on the back of the bread bag. 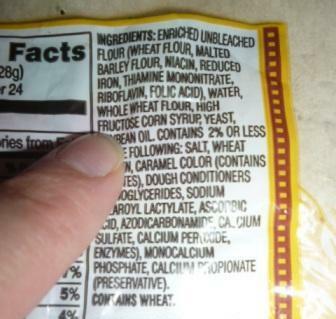 My “Wheat Bread” that I thought qualified me as an “awesome health conscious Mom” when buying was actually full of enriched flour, high fructose corn syrup, and colors….ugh. It made me sick thinking this is what I was feeding my children every day for lunch! I needed to get a better bread for us! The next time I went to the store I looked at every bread label and finally found one that only had Whole Wheat Flour, no high fructose corn syrup, no dyes or colors–it was $5 a LOAF! $5! That took my monthly bread cost from $16 to $40! OUCH. 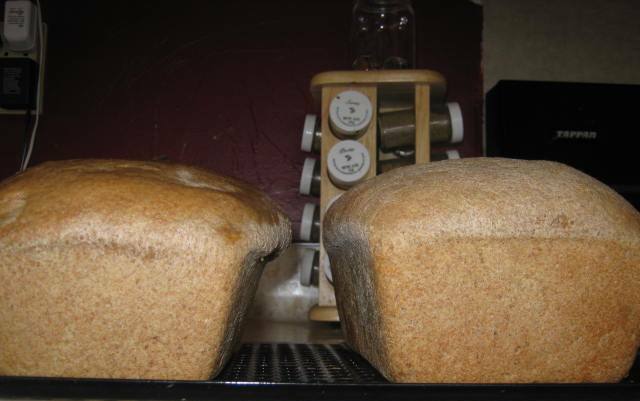 I knew that wasn’t going to fit into the budget but I wasn’t going to feed my kiddos the cheap junk bread, I decided that making my own bread was going to be the healthiest and least expensive option for my family. The Wonder Junior Hand Grain Mill has been so handy to have this last month. I can get a BIG bucket of wheat and make my own flour for several months for less than it costs to buy 2 weeks worth of “healthy” bread loaves. The hand mill is so easy to clean that it honestly doesn’t feel like a ton of work to make my own bread. I also have what I esteem as the best home made wheat bread recipe ever! One night I went to a bread making class at church and tried this bread, it was divine! I got the recipe from my friend Heidi and made a few tweaks to it to make it my own. Below is the recipe and further down I have some tips and tricks for you! Combine 2 TBS yeast with 1/2 c. of the warm water listed above in a plastic bowl. Do not stir. Let it foam in a warm place (stove light or sunshine). Grind your wheat into flour. Rub a bit of oil on your hands to form the dough into loaves and oil the pans. Put the dough in the pan and then flip the loaf over to coat both sides. Leave loaves to rise (about 20 minutes) If the kitchen is cold you can preheat the oven to the lowest temp., then turn it off and set the loaves in the oven, leaving the door ajar for about 20 minutes. When the loaves have filled the pans they are ready to bake. (IF you had them rise in the oven, take the loaves out of the oven before preheating the oven). Bake at 350 for about 25 minutes. Yummmmmmm! Every time I make this bread when we have guests over, both loaves get completely eaten! I have always gotten great reviews on this bread! Let me tell you some tips and tricks now. In the recipe it calls for vital wheat gluten. 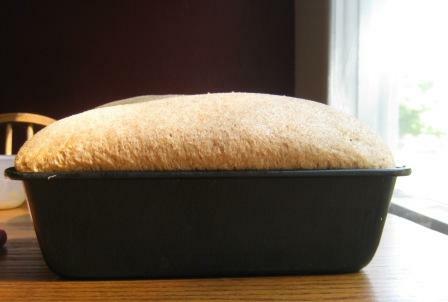 This really helps the bread rise nicely and makes the loaf smooth. It is not NECESSARY as I have made this bread without it, but I do recommend it’s use. It comes in cans, jars, bags, and you can find it in the baking section of your grocery store. This is the kind that I use and as you can see I am nearly out-time for a new bag! My Grandma taught my Mom and she taught me that metal bowls can restrict yeast from frothing and rising, so I always use a plastic bowl for my yeast to sit in. 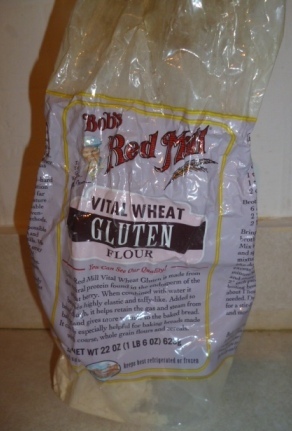 You can use store bought whole wheat flour but it is pricey and has been processed. 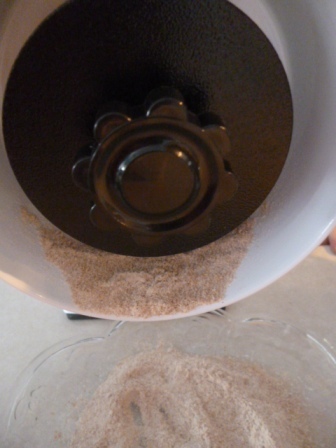 The Wonder Junior Hand Grain Mill is SO easy to use and clean, way easier than my electric mill! Plus the this hand mill can do SO much more than just grind wheat into flour. WonderMill has a whole site dedicated to what their mills can grind. Check it out HERE. You can grind popcorn kernels to make your own fresh cornmeal. Grind garbanzo beans to make a gluten free flour. Grind almonds or peanuts to make your own peanut butter or almond butter….the list goes on and on! They even have links to recipes you can try with items you can grind with your Wonder Junior Hand Grain Mill! If you want to check out my full review of the hand grain mill click HERE. I will be back again in about a month with another recipe featuring the Wonder Junior Hand Grain Mill and a giveaway! One of you lucky readers are going to win one of these hang grain mills valued at $219! In the meantime feel free to pin this on Pinterest so you can save the recipe for later! Just hover over the picture and click the “Pin It” button! You can follow WonderMill on Facebook, Pinterest, and YouTube. Thanks for visiting today! Disclosure: I was given a Wonder Junior Deluxe Hand Grain Mill to try out in order to form an opinion to share with you. Regardless of our arrangement all opinions posted above are my own and were not swayed by our agreement. I hope you will join me over the next 4 blog posts to learn more about this awesome hand grain mill! I am thoroughly impressed so far and have only touched on it’s basic features! I often make bread, but I usually use a bread machine. Sometimes I like to do it by hand, though, just because there’s nothing like the feel of living bread under your hands when you’re kneading it. Thanks for this recipe–it sounds great. And I did not know that metal bowls can affect the yeast, so I appreciate your grandmother’s kitchen wisdom and will use plastic or glass in the future. I’m kind of on the fence about grinding my own flour. I’ve thought of it, but haven’t yet made the leap. It is a good thing to never feed the kids High Fructose Corn Syrup. I think if more Americans knew exactly what these corporations were putting into the foods they would be angrier than ever! Good job mom! This bread looks so delicious and I would like to try it because it looks healthy without all the chemicals that is in bread at the store!! My family eats several loaves a week of what I thought was health wheat bread. You have opened my eyes! I am going to try making my own bread and see how that works with my budget. Thanks for the post. I’d love to be able to grind my own grain, but I’ve got to get myself a mill.